Celebrity pictures (especially in black and white) are popular wall decor; they give your interior a luxurious atmosphere with international allure. Wilhelmina Designs is pleased to introduce you to the use of iconic film star photographs as wall décor. 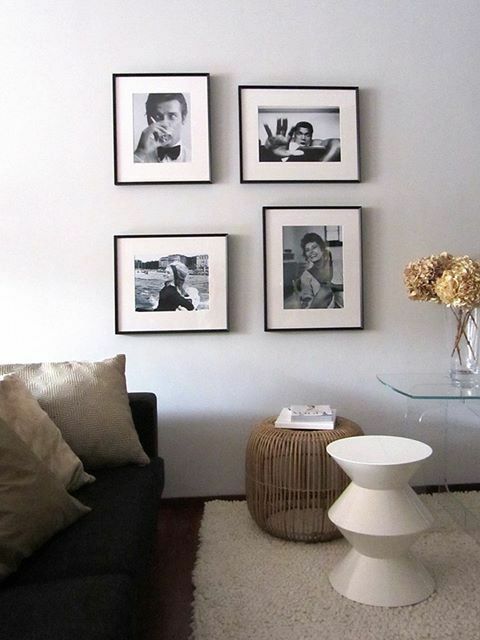 Black and white images of iconic celebrities portrayed in sleek modern frames are more frequently being used as wall decor in modern interior design. These black and white photographs give a space a stylish, international allure, and are often used by wel-known interior designers and portrayed in several interior design magazines. These so called ‘Celebrity pictures’ are pictures of great iconic celebrities of the past, which depict famous historical scenes, like Roger Moore as James Bond. The photo was named “shaken, not stirred” which the preparation of Mr. Bond’s favorite drink. Several different websites offer ‘celebrity pictures’, but these are often standard poster/prints of lesser print quality, lacking the luxury-look of these images. In addition, you often have to pay a costly copyright fee to purchase a print from these other sites. This is why Wilhelmina Designs offers a very high museum quality print, pre-framed in a luxury Nelsen ® frame with purchase. This makes Wilhelmina’s celebrity photos suitable as instant wall décor! The photos are all original high-quality prints (collected directly from the photographers) and come in different sizes. It is also possible to order the frames in different colors or sizes, personal service is applied based on specific needs. Eric Kuster is an excellent source of inspiration for the use of celebrity pictures in interior decor. He calls this style ‘metropolitan luxury’, in which he always makes use of large black and white celebrity pictures. The famous designer is not afraid to group and puzzle together multiple photos of different sizes together. Naturally, if this style is a little overwhelming for your taste, you can also find some wonderful and very different examples of how to use iconic images in design on his website. He can just as easily display one or two framed photographs in place of several as wall decoration. The real eye-catcher is the combination of sleek black frames and white matting with the images. They easily suit different living spaces. Want to bring the 'metropolitan luxury' style into your home? Then use a variety of black and white (celebrity) photos in your living room or bedroom! Find your favorite photographs on our website here: 'wall decor'.